Aside from duration, other key elements of the program were apparently not leaked. These include the pooling of risk. Specifically, are the bonds kept on the ECB's balance sheet or the national central banks. Creditors and debtors are aligned on different sides of the issues. Also, what instruments can be bought? Should bonds with a negative yield be purchased? What about bonds below investment grade? What are the maturity guidelines? The point is that there are many moving parts, and there is plenty of scope for surprises. There is some speculation that the ECB could push its deposit rate more into negative territory, and/or cut the 30 bp emergency lending rate. The focus has been almost exclusively on sovereign bonds, but what of the EU and EIB bonds? We had suggested foreign bonds (US Treasuries), but Draghi dismissed this as too much like intervention. The technical and operational requirements are substantial. It will likely take several weeks to set it up. A March start date would not be surprising, and at least one of the leaks suggested as much. Between early December when ECB signaled it would do take more actions to expand its balance sheet to the time the first bonds are bought, the Bank of Japan would have expanded its balance sheet by roughly 4% of GDP or around $200 bln. This would be the equivalent of the ECB expanding its balance sheet by about 450 bln euros. Leaving aside the precise details, including size, we are not persuaded that increasing the ECB balance sheet will boost CPI. It does not appear have worked by this measure. This is clearly true in Japan, where the BOJ cut revised down its CPI forecast. Without flogging a dead horse, suffice it is here to simply say that base money rises under QE, but not money supply. The decline in the euro and the decline in oil are net positive developments for the eurozone. Core inflation remains positive. Bank lending to households and businesses is improving gradually. It seems more a demand than a supply problem. A point that we think has been lost on many observers is that fiscal policy is also going to ease. The new European Commission has indicated a considerably more balanced approach to the fiscal targets. In effect, through its application of the rules, greater flexibility will be shown in exchange for structural reforms. What we are witnessing now appears to be a realignment of institutional power away from the creditors. This is the meaning behind the slur in Germany referring to the ECB as the Banca d'Italia Frankfurt office. However, there is a difference between Berlin and the Bundesbank. Merkel did not object to OMT. She apparently will not object to a sovereign bond buying program, no matter what her private misgivings may or may not be. German members of the ECB quit over the first attempt to buy sovereign bonds under Trichet. The German members did not agree with OMT. They have dissented on minor issues and large ones. 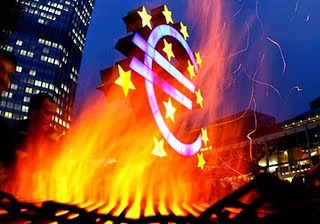 Despite compromises reached, the German members of the ECB most likely will not approve of the new bond buying scheme. The relative isolation of the German delegation to the ECB should not be confused with the isolation of Germany or Merkel. The Bank of Canada continued the parade of central bank surprises with a 25 bp rate cut yesterday. Policy has been on hold since September 2010. The Canadian dollar which sold off (-1.4%) on Tuesday in response to poor data took another leg down in response to the surprise rate cut (-1.8%). It was the single biggest decline in the Canadian dollar in three years. Governor Poloz framed it in terms of insurance policy given the downside risks to growth and inflation. This means that it need not be the start of an easing cycle. This year's GDP forecast was cut by 0.3% to 2.1%, which is still respectable relative to most other high income countries. The 2016 growth forecast was lifted by 0.1% to 2.4%. Headline inflation forecasts trimmed, but the core is expected to remain mostly steady after some softness here in Q1. Still, Poloz made it clear that more insurance may be needed if oil prices continue to decline. The race lower in interest rates may see Australia join the ranks as next month. The Australian dollar itself lost a cent in reaction to the BoC rate cut. Indicative pricing in the derivatives market suggest increasing positioning in this direction. Brazil delivered the as expected 50 bp rate hike, which is counter to the generalized trend. The tightening cycle is in the late stages, and another hike in March cannot be ruled out. Such an interest rate race is not nearly as troublesome as a true currency war of beggar-thy-neighbor competitive depreciations. Currency wars are zero-sum undertakings. It allows one country to take aggregate demand from another country via exports. Lower interest rates can help foster new demand. It is not zero-sum.